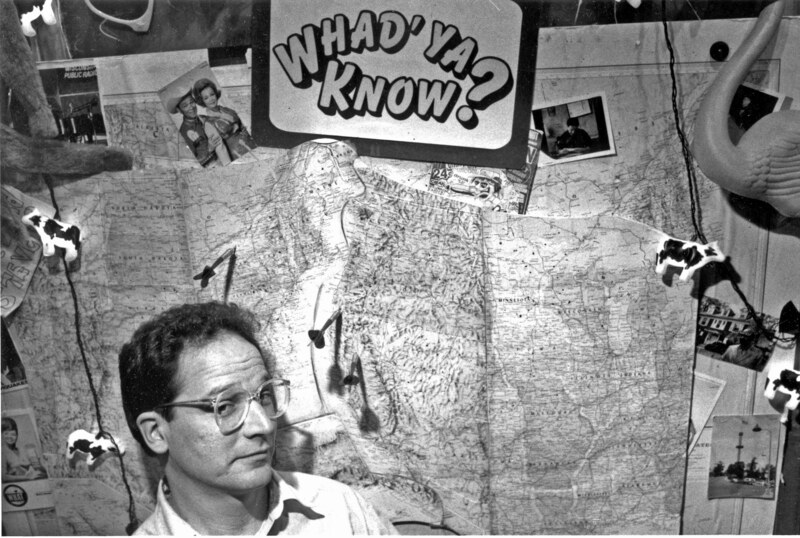 Whad’ya Know, It’s 1985 | Whad'ya Know? « Funny You Don’t Look 3O Party All Sold Out! All right, it’s June 1st, 1985. (Humor me). I’m doing the first and possibly the last Whad’ya Know? in historic Philo Buck studio, 7th floor Vilas Hall, WHA radio, first to broadcast to all the ships at sea, etc, etc. But, I am still living and drawing unemployment in Chicago while suffering PTSD from WGN Who-Goes-Next radio experience, attached at the hip to a copter traffic reporter; Cantaloupe and Feldstein as Uncle Bobbie called us. I will tell you that when I went to unemployment on Division Street and they asked what I was looking for, I told them drive time would be nice, no partner, 50k to start but that’s negotiable. They told me they had lawn care for 4.83/hr (4.85 in today’s dollars) but I would have no partner. Tempting. Anyway the erstwhile Jack Mitchell, head of Wisconsin Public Radio, my mentor/tormenter on a couple of earlier shows on WHA, sensing desperation in my on-air persona, met me half-way exactly at the Clock Tower (because of the clock and the tower) Inn, Rockford, asked me what I would like to do should I come back. With both ‘nothing’ and ‘never’ rising in my gorge, and trooper that I am not, I said I don’t know, something national I think (WGN’s 50,000 watts reached most of the same territory as Lewis & Clarke, a heady experience for a kid from Milwaukee). Calls-in’s, but not on hot button issues, small talk radio, maybe a quiz to get people to call in, live audience, because without them I’m dead, a little combo for musical fills if we can find someone to work as cheap as John Thulin. This entry was posted on June 8, 2015 at 4:42 pm and is filed under Uncategorized. You can subscribe via RSS 2.0 feed to this post's comments.